Are you a homeowner? Do you have a residential project to complete? 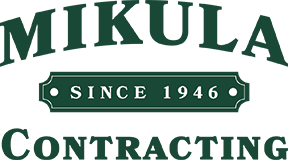 You may need Mikula Inc. and their residential services. We can take care of that large project that has been holding you up; fast, pain-free, and cost-effectively. Don’t let your project stretch out and disrupt your life. Hire us to handle small to large projects quickly and with minimal evasion to your life. You love your home and need to make some improvements. Maybe you can complete many projects yourself on the weekend. Demolition is not one of those jobs. It takes a licensed professional and requires permits. It’s probably not a job you would want to take on even if you could. We have the experience and equipment to get your demolition job done fast, safety, and worry-free. We can handle residential services like the following; House Demolition jobs, Garage Demolition, In Ground Pool Removal and Concrete Removal from your property. Water is essential to our lives, and we couldn’t have beautiful lawns without it. However, unwanted water, leaks, backups, really any form of unwanted water is a nuisance that can cause major damage to your landscaping and even the structure of your home. Let us take care of your drainage needs and get back to enjoying your home. Call us for a fast and free estimate if you are having issues with street water, lawn water, stormwater damage, or trench drainage systems. We also provide Ground and Land Drainage, Backyard and Lawn Drainage, Rain Water Drainage, Driveway Drainage, Seepage Pit Installation, and Standing Water Drainage. When it comes to excavation we have you covered with the following services: Site Excavation, Excavations of Foundations, Utility Trench Excavation, Land Clearing, Seepage Pits, Material Removal, Rock Stabilization and Removal, Areas Served Residential Oil Tank Scans. Whether you are a homeowner, a homebuyer, or a real estate agent you will want to protect yourself from the possible hard, lability and financial problems that can occur if you have an improperly buried underground tank on your property. A pool is a great addition to a home. There are occasions when they are no longer useful. Maybe you need to sell your home and not having a pool makes more desirable, or perhaps you are just tired of the constant maintenance. We have the experience to go from free quote to finished job quickly and painlessly. Need materials brought in for a landscaping project? Have your large or small load of stone, fill, or sand delivered right in your yard. Let us deal with the logistics of getting what you need to your site, while you get back to your project. Whatever your needs are we offer free estimates and will work with you to ensure you get exactly what you need fast and right the first time. We service Essex, Hudson, Bergen, Passaic, Morris and also Union Counties. Get a Fast Quote for residential services in Northern NJ throughout Essex, Hudson, Bergen, Passaic, Morris, and Union Counties.